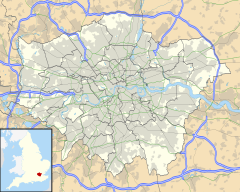 Addington is an area of South London, England, within the London Borough of Croydon. It is located 11.1 miles (18 km) south of Charing Cross. It lies within the historic county of Surrey. In ancient days named Edintona, then Eddintone. The village lay within the Anglo-Saxon administrative division of Wallington hundred. Addington is thought to be named after Edda, a Saxon. In the Domesday Book, two manors are mentioned, linked with the names Godric and Osward. Addington Place, later known as Addington Farm and now called Addington Palace, dominates the village above the church of St Mary the Blessed Virgin Church and The Cricketers pub. The manor house was situated behind the church and was the residence of the Leigh family. From this Leigh family, Patricia Knatchbull, 2nd Countess Mountbatten of Burma is believed to be descended. There is an oft repeated, but false account of a royal hunting lodge, "where King Henry VIII supposedly wooed Anne Boleyn, whose family owned nearby Wickham Court" by West Wickham Parish Church. However, the Anne Boleyn of Wickham Court was the aunt of Queen Anne. The Palladian mansion was built in the mid-18th century by Barlow Trecothick, from Boston, Massachusetts in the United States, who returned to England and became an MP and Lord Mayor of the City of London in 1770. After his death without heirs, his nephew James Ivers (later Trecothick), also of Boston, continued his uncle's work and had the grounds laid out by Lancelot Brown. The estate was sold and eventually, as Croydon Palace became too inconvenient and unsanitary, the Addington house and part of the estate was bought for the Archbishops of Canterbury as a country residence. The last Archbishop to use it was Archbishop Benson. In the 20th century, technological advances and population growth in the region led to many changes in the way of life for people in Addington. At the beginning of the century, Addington was in the county of Surrey, which had established urban and rural districts to provide services matched to the needs of the differing communities. The parish of Addington was transferred to Godstone Rural District on abolition of Croydon Rural District in 1915. Subsequently, Addington parish was absorbed by the County Borough of Croydon in 1925. Since 1965 the county borough has been part of the London Borough of Croydon within highly urbanized Greater London, which ended over 900 years of administration by the county of Surrey. New Addington was developed to the south of the existing village from the 1930s onwards. There are still several old houses and buildings in Addington and, even though there has been some fairly modern building, the village atmosphere is intact in the 21st century, despite its being in Greater London. There is a blacksmith's forge, dating from around 1740, now mainly making ornamental ironwork. The hunt used to meet outside the pub, The Cricketers which has reverted to its former name once again after a temporary change of name. The village co-operative store and post office is now a private house. The book, Addington: A History was written by Frank Warren, and published by Phillimore & Company in 1984. St Mary's Church, Addington is an Anglican church in the village. It is associated with the Archbishops of Canterbury of the 19th century, who lived at nearby Addington Palace. Five successive archbishops are buried at the church: Charles Manners-Sutton (d.1828); William Howley (d.1848); John Bird Sumner (d.1862); Charles Longley (d.1868); and Archibald Campbell Tait (d.1882). Addington Village Tram Stop connects the area with Tramlink services to West Croydon and New Addington. Addington Village is served by seven buses ran by Transport for London, which connects it with areas including Bromley, Croydon, Eltham, Hayes, New Addington, Orpington, Purley and Thornton Heath. Cricket has been played in the village since at least the 18th century. ^ "Farnborough (Kent) Telephone Code. Farnborough (Kent) Area Code". ukphoneinfo.com. ^ Lysons, Daniel (1792). The Environs of London. Volume 1, County of Surrey. London. pp. 1–10. Retrieved 25 February 2015. ^ "Online communities". 22 January 2016. Wikimedia Commons has media related to Addington, London.